The weather forecast was good with the Mountain Weather Information Service giving the chance of clear Munros as being 60%. I wanted to start the year doing what I like to do most; climbing hills. I considered an easy day up Ben Wyvis - As the crow flies, the nearest Munro to home (36km/22miles) and good roads all the way. A friend of mine was heading up Ben Wyvis with her family and she seemed to think that a lot of people would be heading up there. Ben Klibreck is second nearest at 41km 25miles but I headed for the third nearest, Am Faochagach. My chosen route was from from Alladale, partly because the start is nearer to home and partly because I wanted to include the Graham, Meall a'Chaorainn. This is a much more challenging day! 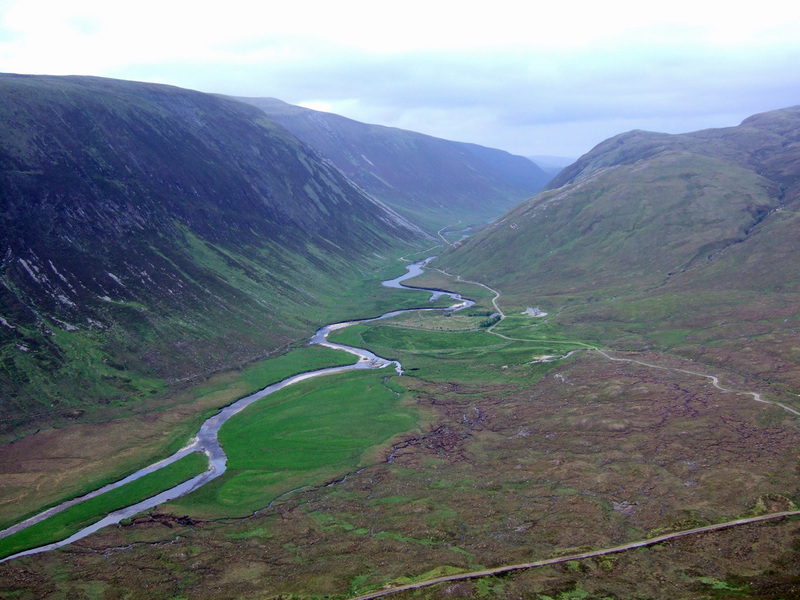 Most ascents of Am Faochagach are made from Dirrie Mor to the south or Strath Vaich. 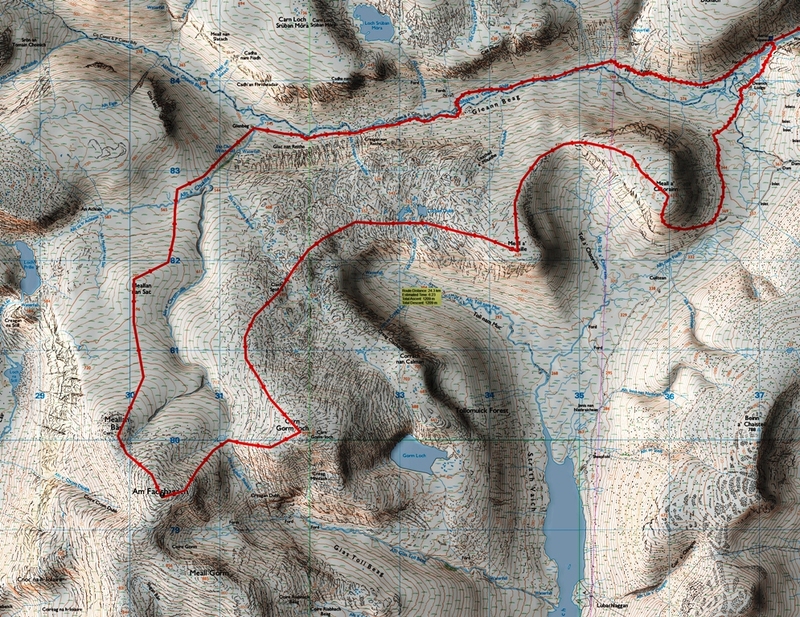 The route from the north is much longer and crosses a lot of pathless terrain. Icy conditions on the track up Gleann Mor necessitated great care and a reduced speed. I set off from home in the dark. The main roads were fine but the lane up the south side of the River Carron was icy and I momentarily lost control of the car at the bend before the bridge across the River Carron. Clearing the ice patch, I was able to regain control. 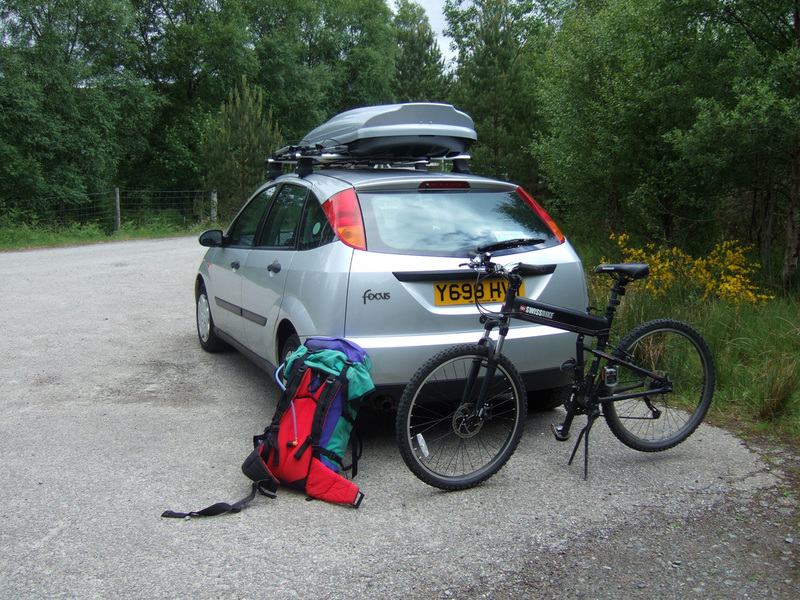 There is a lot to be said for selecting hills that can be approached from the main roads at this time of the year. I knew that there was a good car park as I had used it for Carn Chuineag in 2011. My setting off from the car coincided with first light. The route follows a very good track until turning left opposite the tradesman's entrance to Alladale Lodge. 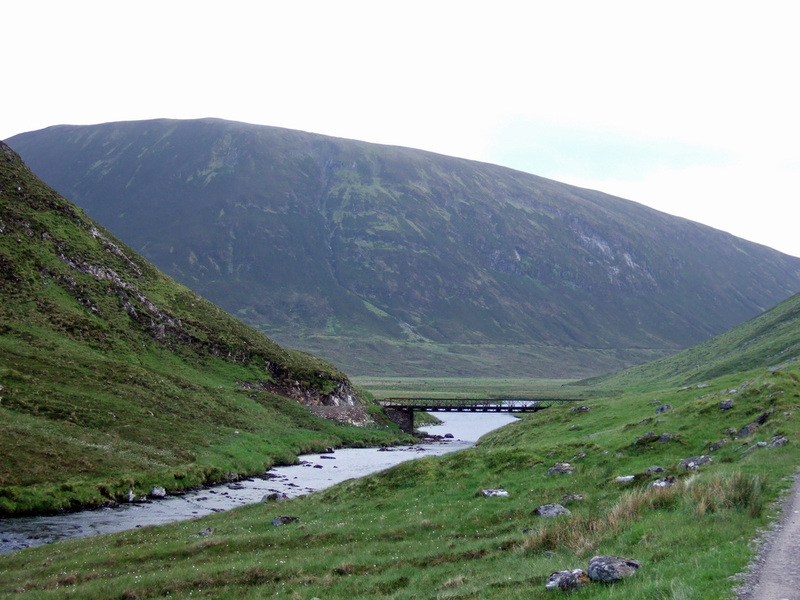 There are a number diverging tracks at this point but the main track heads uphill for 60m before reaching the almost straight track up Gleann Mor. The water in the potholes was frozen so there was a loud crunching noise and loss of momentum in every hollow. Rising out of my saddle to attack the uphill sections resulted in wheel spin. 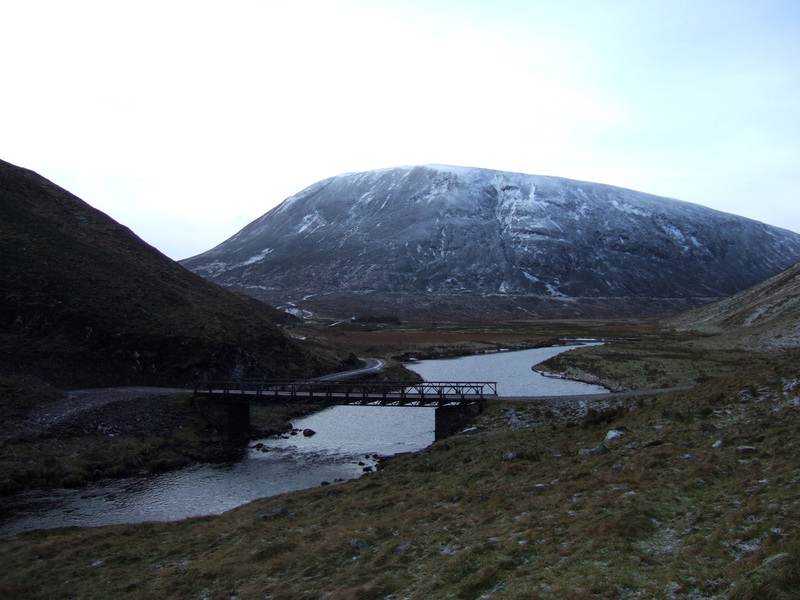 I was glad to reach the bridge near to Deanich Lodge where I gained my first view of the day's first objective, the Graham, Meall a'Chaorainn. 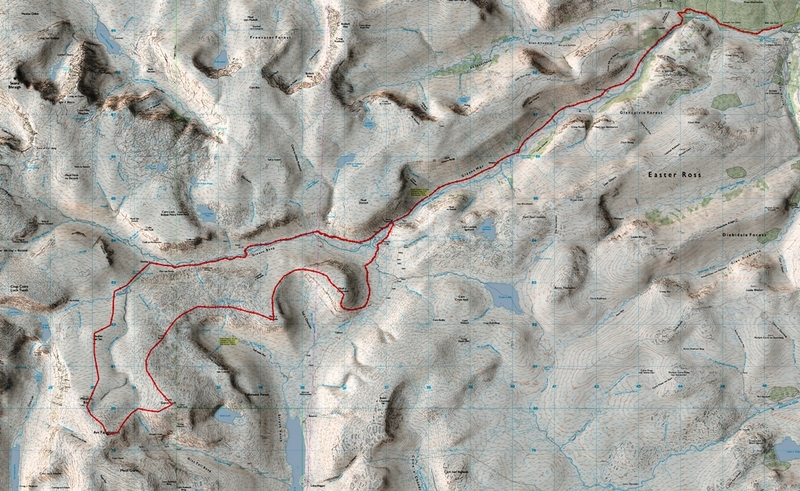 I had considered including this in my route after Beinn a' Chaisteil as its ascent looked so easy, albeit rather steep, but with the weight of bothy gear in my pack, I decided to push on to Glenbeg bothy. The "route" follows the left skyline in the photograph above. It is a strenuous but safe pull up to the summit. 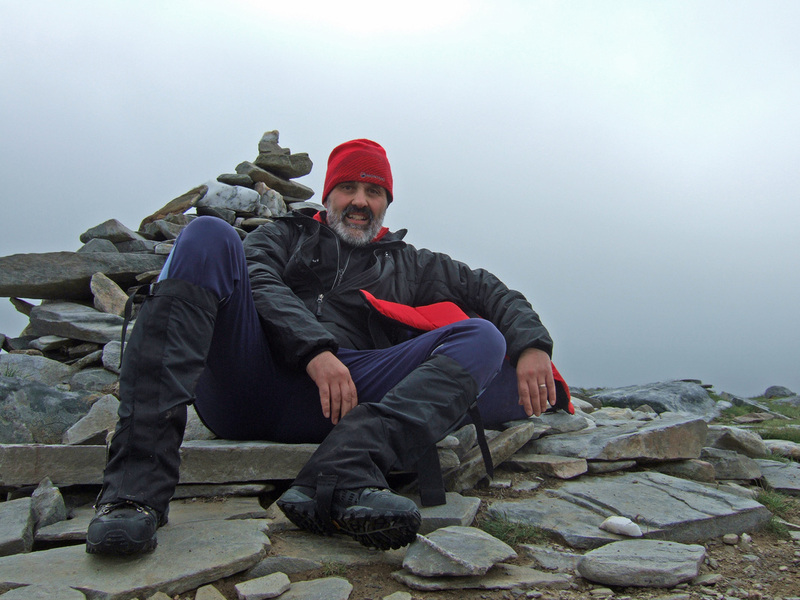 It is always nice to reach the summit and enjoy the views, but as one grows older and climbs more and more hills, the peaks are more than shapely forms within a wild landscape, they are links to all the memories of past adventures. ​The descent down Meall a'Chaorainn was a gentle gradient though there was a certain amount of peat hag before the rise to Meall a' Guaille​. This does not seem to appear on any lists but I like to include every little bump, if time allows. The photo below was taken between Meall a'Chaorainn and Meall a' Guaille and shows the Corbett Beinn a' Chaisteil and Loch Vaich. The route ahead saw more extensive peat hag. The crust was frozen but sometimes my feet broke through to the bog beneath. As I looked towards Corrach nan Calman, I thought that I could see a walker. I thought that I saw it move; perhaps a moving cairn? On reaching Carn Gorm-loch, I skirted around the summit as I was aware that I was going to run out of daylight and I wanted to be safely down in Gleann Beag before nightfall. 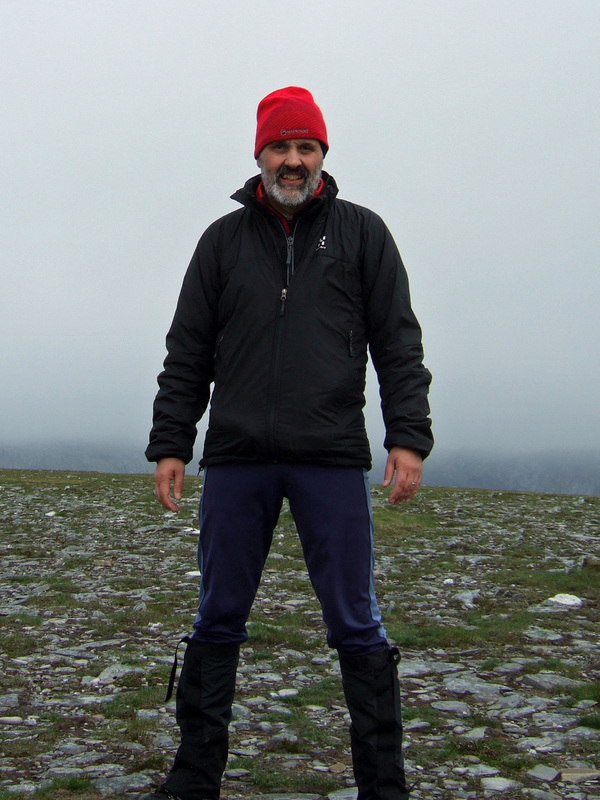 My tired legs meant that the final climb to the summit Am Faochagach seemed steeper than it really was. 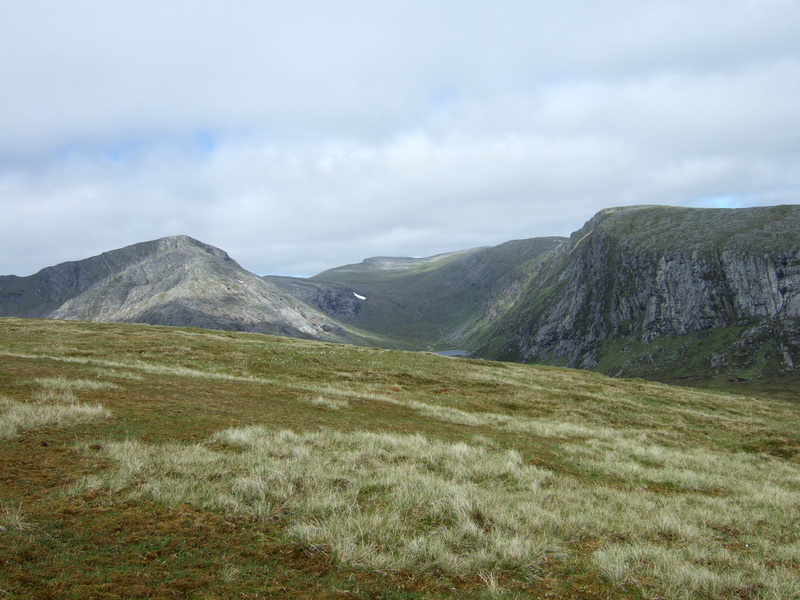 The summit provided good views of Seana Bhraigh and Carn Ban. Am Faochagach only has a small cairn and no trig point. However, the slight rise of Meallan Ban to the north sports a much finer cairn. The final photo of the day - The Munros Cona' Mheall, Meall nan Ceapraichean and Eididh nan Clach Geala. Loch Tuath and Loch Prille can just be seen. 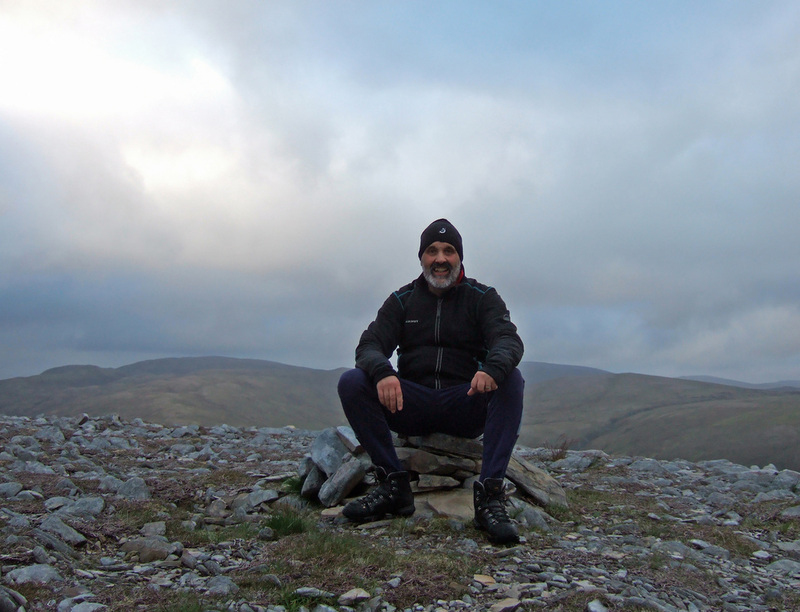 Good visibility, even in fading light made navigation easy and I descended the hill directly to Glenbeg bothy where I finished my coffee and had a bite to eat. I hadn't stopped for food much while out on the hill and up to that time just eaten a single sandwich. By the time I left the bothy, it was completely dark. 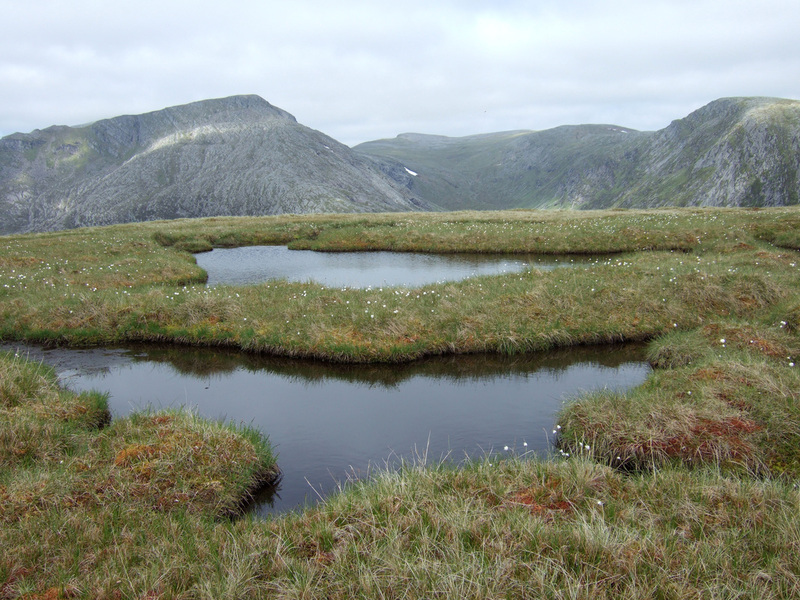 The walk down Gleann Beag only has a faint, intermittent path and crosses rough and boggy ground. There is a small dam where you can cross the river and join a track. From here onwards it was much easier going, though it was still another 4-5 km of slippery track to the bike. On several occasions I could see alien-like eyes peering at me through the darkness. They were the eyes of deer reflecting the light of my torch. At a distance, only their eyes could be seen. I left the bike near to the bridge as this would act as a landmark to find my bike. I would not want to be searching for my bike in the dark. The shiny brake levers and reflectors meant that I saw the bike before I saw the bridge. 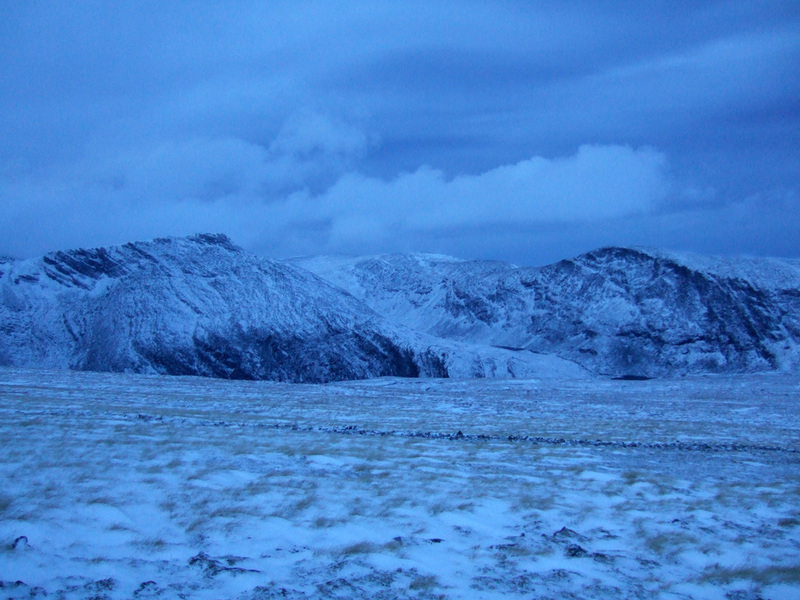 The temperature had rose a little and the track down Gleann Mor was not quite as icy as it had been in the morning. I took it steady, though on one occasion, a big gust of wind saw me accelerate forward and forced me to brake. Going up, I found that cycling up the middle of the track avoided the ice covered pools in the ruts. However, a vehicle had clearly been up the glen during the day and displaced the ice, so steering between the pools saw me hitting large chunks of ice. Descending into Alladale, the track was much smoother and clear of ice and I was able to speed along back to the car, arriving at 21:20. This was over thirteen hours since I had left the car! 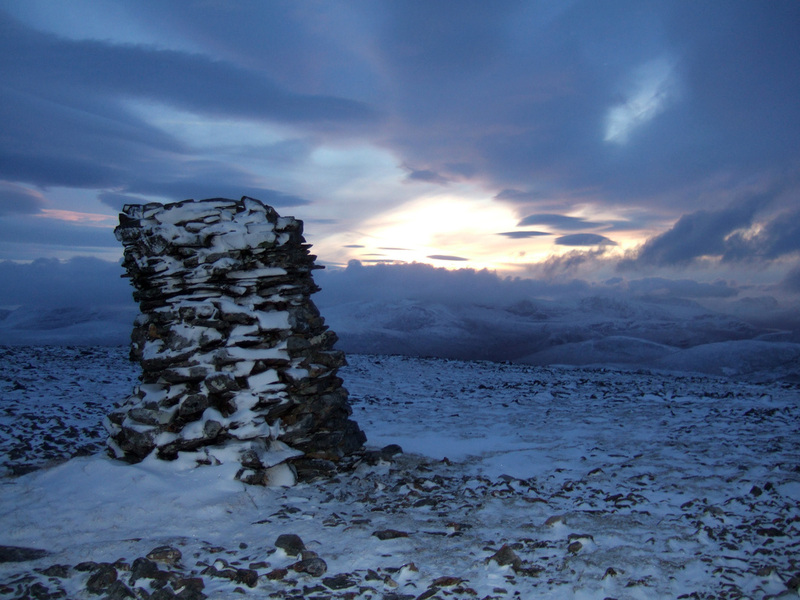 Next New Year, I may opt to join the crowds for an easy day up Ben Wyvis! It is unusual that I should return to the same mountain so soon after a prior ascent. I lost my sunglasses somewhere and one possibility was the summit. The sunglasses were kept in the lid pocket of my rucksack and it is possible that I took them out when I took out my compass which may have been while on the summit. I tackled the mountain by the shortest route form Dirrie More. This is notorious for crossing a swamp followed by a (sometimes difficult) river crossing. I do not like water filled boots. Wet fell shoes are nowhere near as bad. So, although winter, I adopted the unusual combination of fell shoes and ice axe. The "swamp" is more of a bog and was partly frozen. It really was not much of a problem and on reaching the river, I rolled up my running tights, I skipped across shallow water to an island, walked downstream and ran quickly through knee deep water to the far bank. 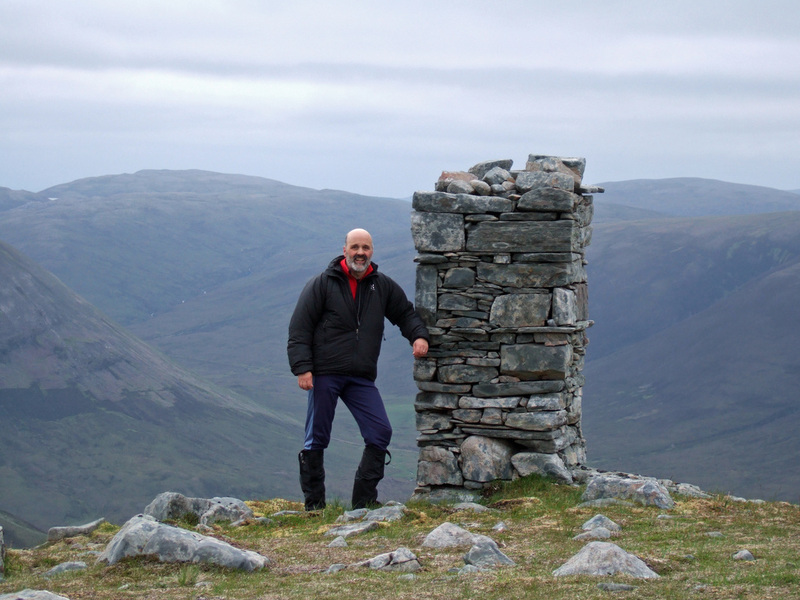 I headed up to Sron Liath, where there is a small but well constructed cairn, rather than the bealach to the north. I marked the route back down with arrows in the snow. Visibility was poor and the terrain a little confusing so I had to rely on my compass. Fresh snow slowed down progress a little. There is a small cairn at spot height 845 before the final push for the summit. I searched extensively for the sunglasses, kicking the snow and digging with my axe, but to no avail. The cloud precluded any photographs of the neighbouring hills and condensation on the lens meant that the selfie to the right was the best I could manage over several attempts. The best photos were obtained close to Loch a' Gharbhrain a little after 2pm when the cloud began to clear from the hills. Taken with my camera and stitched L 2 R Beinn Enaiglair (Corbett), Beinn Dearg and Cona' Mheall. Taken slightly lower down with my phone - also L to R Beinn Enaiglair (Corbett), Beinn Dearg and Cona' Mheall. 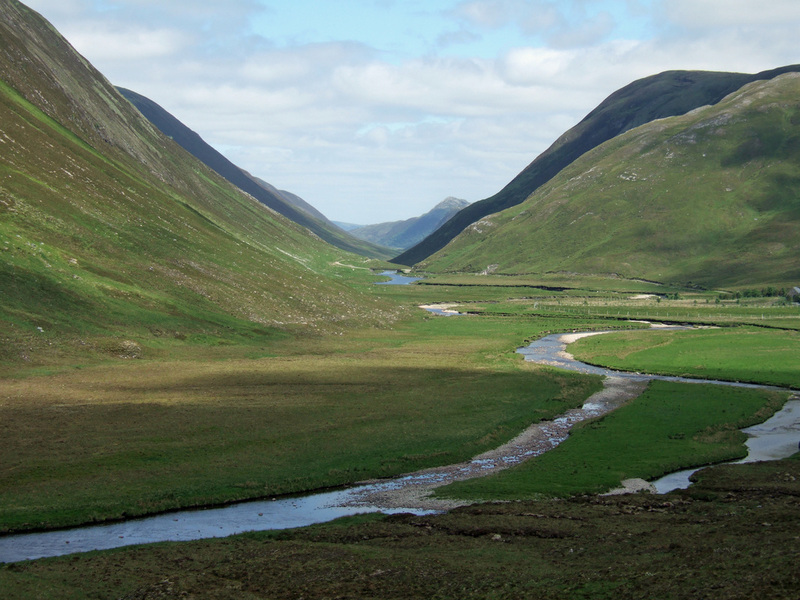 The river had been crossed and I looked back to Am Faochagach which had cleared! The summit is out of view. To repeat a route similar to my New Years Day trip, but in summer conditions. To have a wild camp - my first night of camping since last July. To try out my new THERM-A-REST - NeoAir Xtherm (small) sleeping mat. To see if I could find the sunglasses that I lost on New Year's Day - a long shot, I know! Develop a bit of mountain fitness after my weekends marking for the IB. Be home by 1300 the next day as Yuliya had a driving lesson booked. ​Following the mice damage to my Gregory Z55 rucksack, which is being repaired by a kind colleague, I used my 1989 Berghaus Cyclops II. Other than the elastic in the hood going many years ago and a greasy stain that I cannot completely remove, the pack remains a solid piece of kit and a reasonably comfortable carry. The 65 litre capacity makes packing that bit easier. 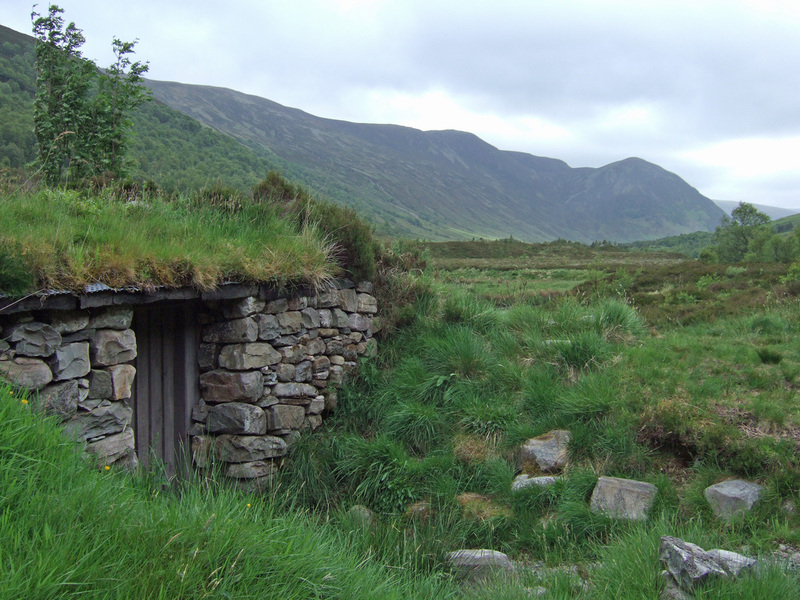 On the way up Gleann Mohr, I passed this fine little bothy. I had cycled past it without noticing it during my last visit to the glen. The bridge near to Deanich lodge was my first place to look for my sunglasses as this was where I had left my bike on January 1. I took a good look at Deanich Lodge, which has oil-fired central heating and electricity, presumably from a generator in one of the outhouses. 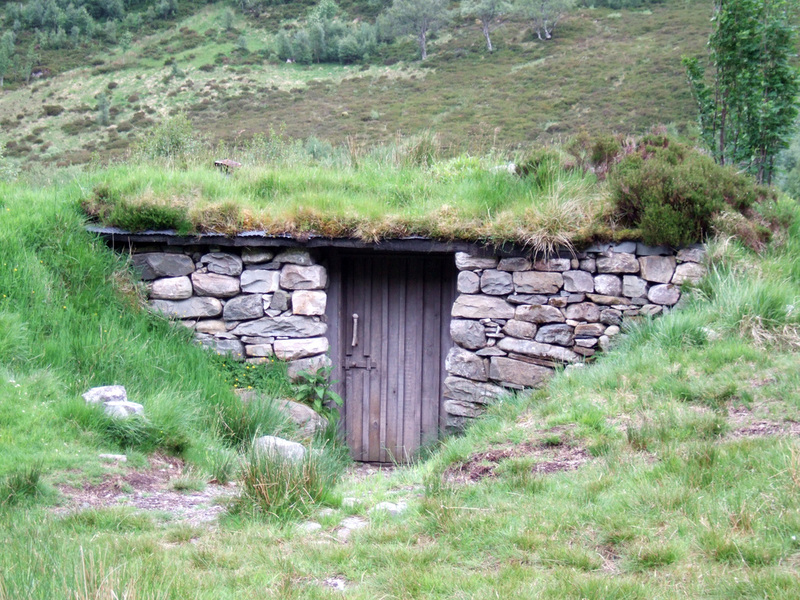 It is certainly a few notches up from your average bothy! I continued on my bike across the small bridge before leaving it close to a small cairn. I am not sure of the significance of this cairn; perhaps the resting place of a faithful hound. 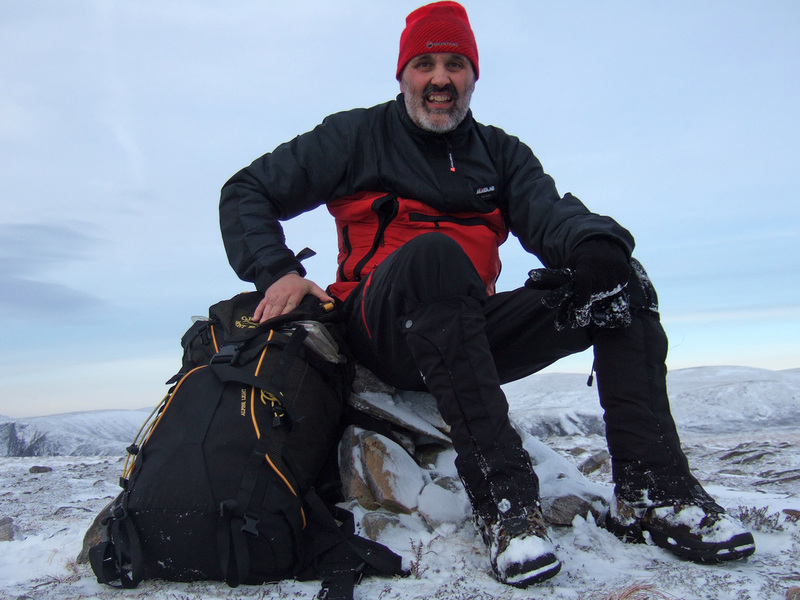 My previous ascent of Meall a'Chaorainn had followed steep slopes to the SE of the summit. This time, I took the unwise decision to make my way up the shallow gully seen in the photograph of Meall a'Chaorainn above. This started off as dry rocks but led to wet slabby rock forcing me to pull myself up well rooted heather to the right. 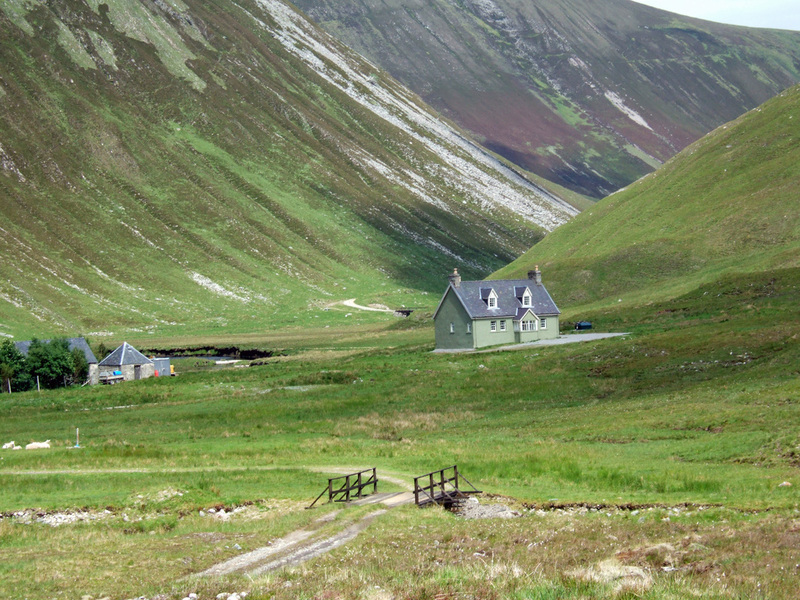 It did however provide me with a better angle to photograph Deanich Lodge and the top end of Gleann Mohr. An easier walk led to my next checkpoint in my search for my sunglasses, but I found nothing. It leaves me wondering how often this Graham is visited. There must be a significant number of people doing Grahams or the SMC would not have published a guide, but this is quite a remote one for those that climb Grahams as easier options on wetter days. I continued along the same route as before, at least more or less as there is no path. I checked the peat hags where I had stopped for coffee. 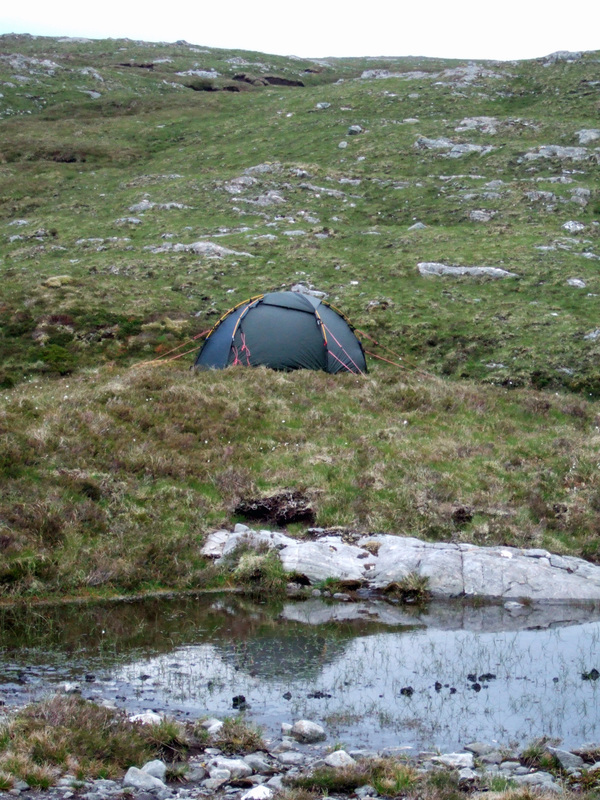 I was unsure as to where I would camp but by 22:30 I was feeling a little tired and Lochan Dubh seemed like a nice spot. It was not a very smooth spot, pitched on a mixture of grass, moss and heather but relatively dry. Using the pump sack for the Therm-a-rest took quite some time but I was trying to avoid blowing it up by mouth with the resulting condensation within the mat. I was using the sack provided with the mat. It is possible to buy a much larger pump sack for around £15-20, which should make the process a lot quicker. Eventually, the mat was inflated to a good degree of firmness and I was soon asleep. I arose at 0530 and did a circuit around the loch to take some photographs of my campsite. Am Foachagach to the left and Carn Ban to the right. On my way round, I startled a dotterel (Eudromias morinellus) from its nest. 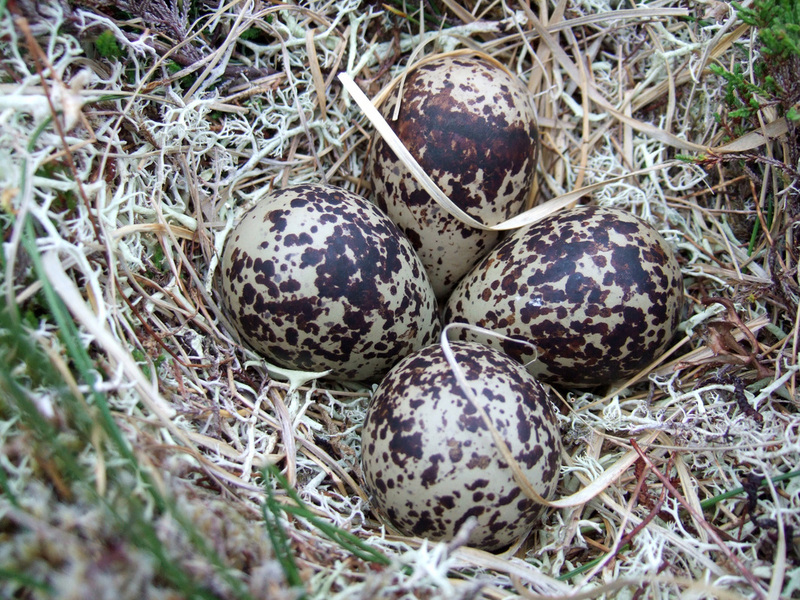 I gather they are in decline in Scotland (conservation level red), possibly due to climate change affecting their food supply of invertebrates: Dotterel declines in Scotland: Out of sight out of mind? On returning to my tent, I noticed that I had not pegged out one of the guylines. There had been nothing more than the slightest of breezes during the night so it was not a problem. 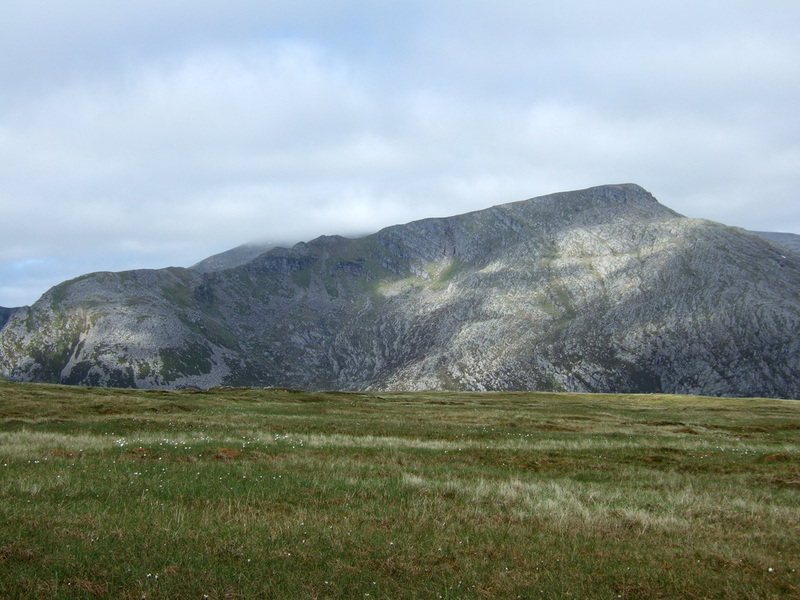 I broke camp quite quickly and set off for my first target - Creag Lachach. When I was here New Year's Day, I thought I could see a walker moving. However, "the walker" never actually moved on, leading me to believe that it was just a cairn. With "the walker" still there almost 6 months later, I thought I should check him/her out! Above: "The Walker" with left to right: Meall a'Chaorainn (Graham), Beinn Tharsuinn (Graham), the distant Carn Chuinneag (Corbett) and the massive Beinn a Chaisteil. 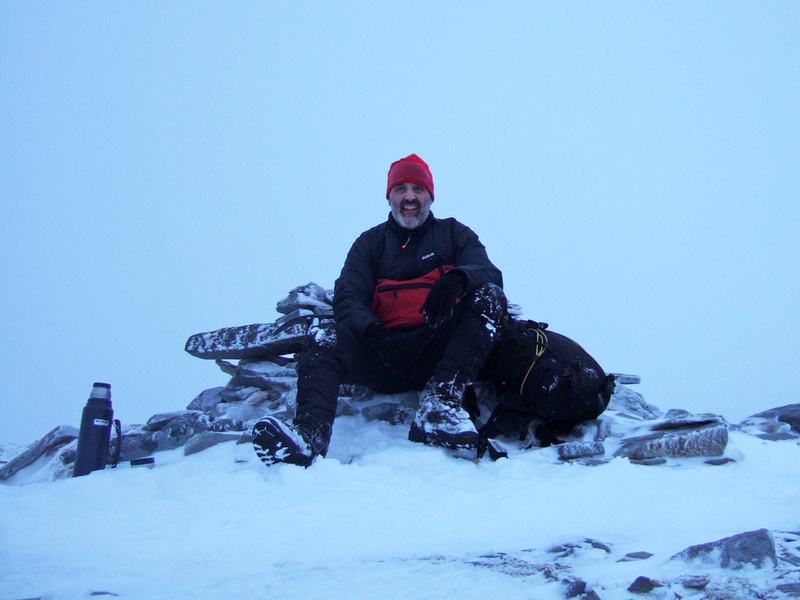 ​Below: With my imaginary walking companion on Creag Clachach. Although I was at 705m, I had Carn Gorm-Loch between myself and Am Foachagach - Over 3km and 400m of ascent. The views to the west were beginning to open up as I gained height: L to R Eididh nan Clach Geala; Stac Pollaidh (distinctive peak in the distance) and Seana Bhraigh. I had headed off from camp with only eating a cereal bar and a few nuts, as I was aware that I needed to be home by 1300. This was beginning to tell as I pushed onward with my energy levels low. I did not linger long on the summit - just long enough for a few selfies and to have another look round for my sunglasses. No luck again! It was easy going down to Meallan Ban and although I was beginning to sense that I was well behind schedule, I still stopped for photographs. The skies were clearing and visibility improving. I would have liked to have lingered, possibly cooking some noodles and having a brew, but I continued. It is strange when you know that you are safe and have plenty of daylight but still feel anxious about the time. 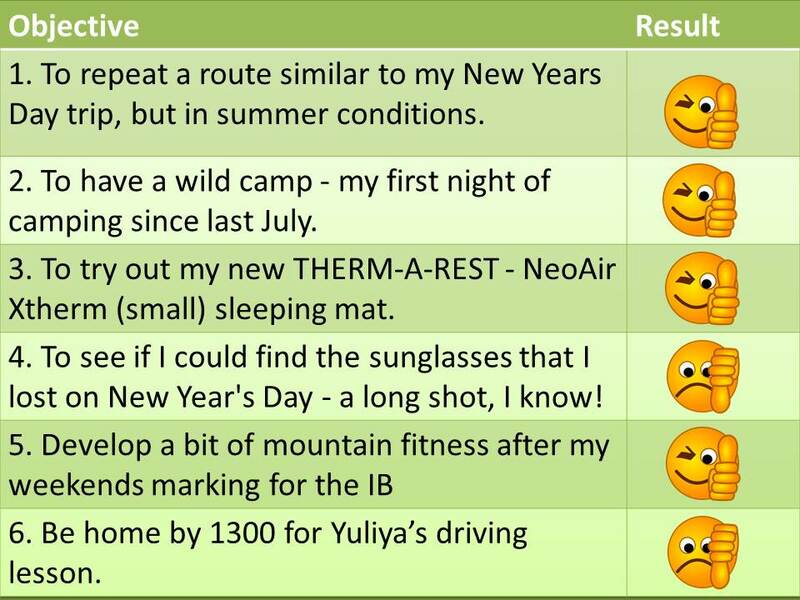 I was beginning to feel annoyed about Yuliya booking a driving lesson in the middle of the day as it totally messes up the day - not much time to do anything either before or after. Above: Cul Mor and Suilven in the distance with Seana Bhraigh and Creag an Duine to the right. Notice the extensive thrift adding a splash of pink! Above: Cona Mheal - Beinn Dearg still in cloud. 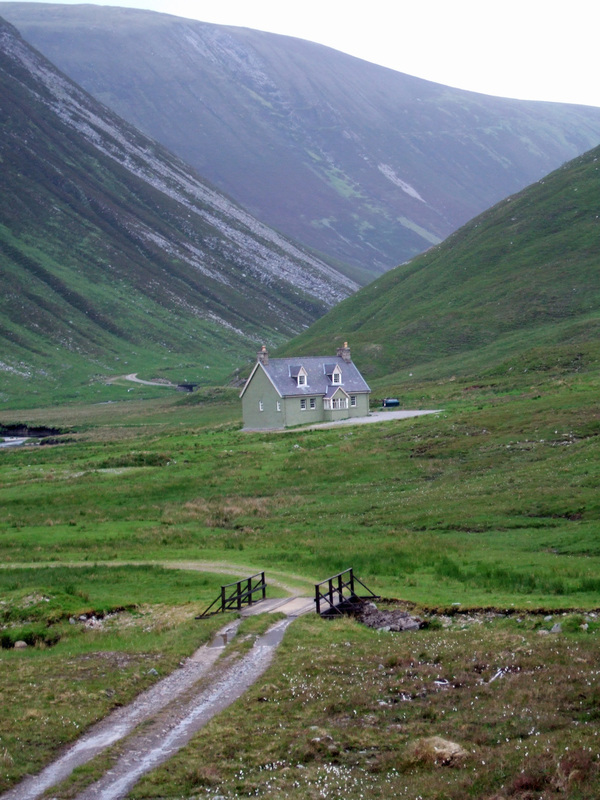 On reaching Glenbeag bothy, I was resigned to the fact that I was not going to be home for when I had promised and accepted that I would have to spend a period of time in the doghouse. When last here the door had been secured with copper wire which someone had cut through. 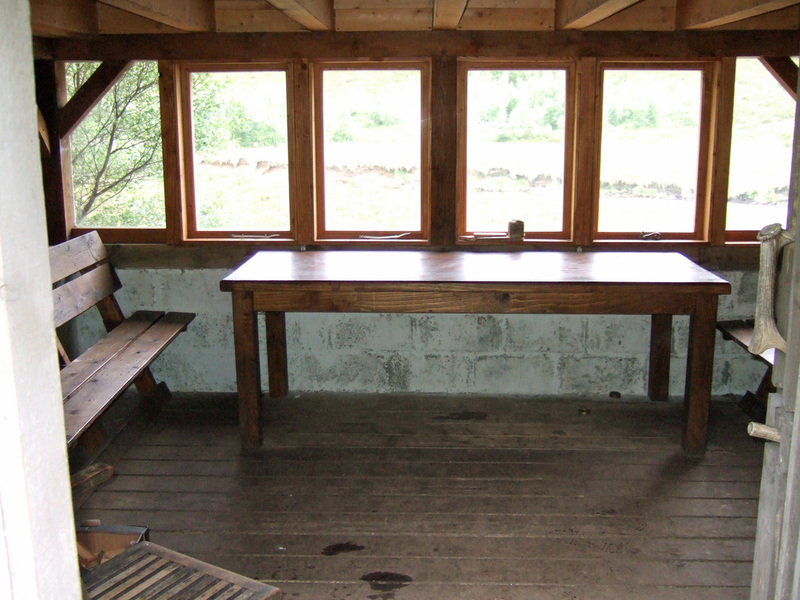 This time, all the indications were that this is still an open bothy. Though it is no longer maintained by the Mountain Bothies Association, the MBA signs are still up. I think that in the hands of the MBA it would be better maintained and a little cleaner inside. That said, it still offers good shelter and is well positioned for Carn Ban or a multi-day trip linking the bothies in the area. I was aware of having carried a gas stove and fuel all this way without using it and realising that there was zero chance of returning home for 1300, I took a bit of a break. After Thai Green Chili noodles and coffee, I headed towards Deanich Lodge, as the skies opened up and Gleann Beag was bathed in sunshine. I was glad to reach my bike as it meant a slight change in the muscles being used and a net downhill would help to maintain my momentum. 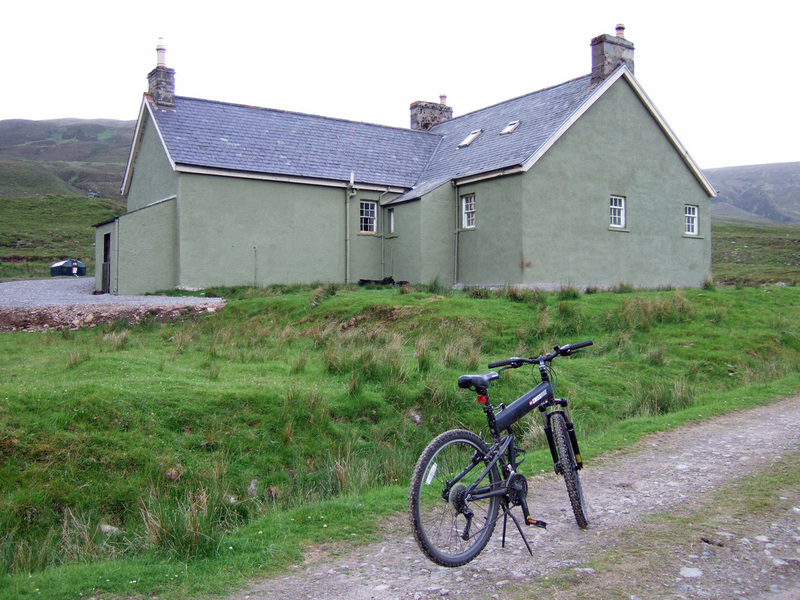 I stopped off at the bothy in Gleann Mohr to take some more photographs before the last few kilometres back to the car. Footnote on my first ascent in August 1993. 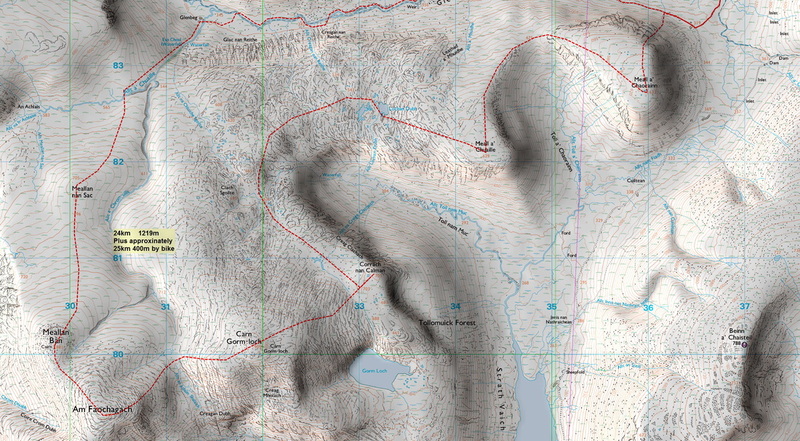 I used Irvine Butterfield's The High Mountains as my main guide book as the route descritions/maps were clearer and they provided more challenging days. 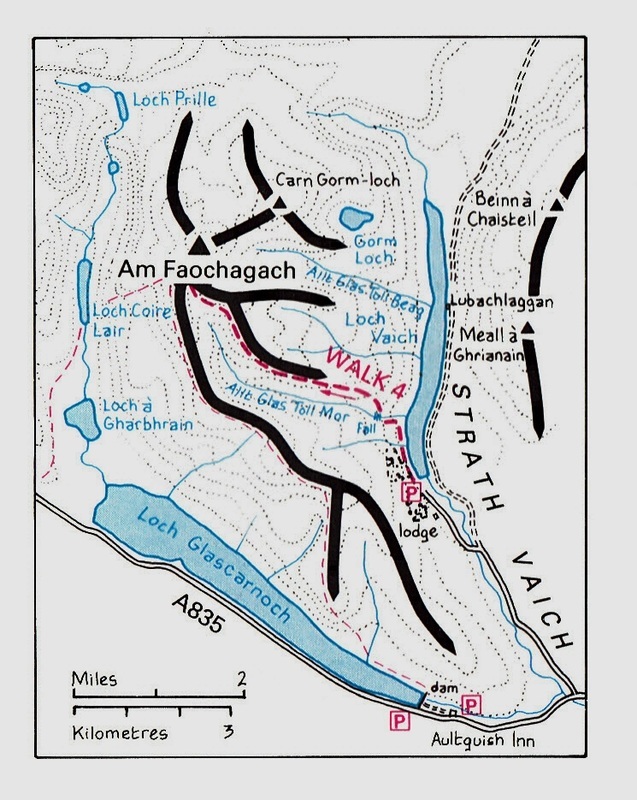 Also the book was written with routes designed to cover all the tops , not just the Munros. I believe, I followed his recommended route. It sets off from Strathvaich Lodge on the basis that one could park there. This is now discouraged, necessitating a bike ride at the start.